Contains Moisturing Essence which leaves skin softer and more supple. It is therefore important to keep the collagen in our skin fresh and healthy. If we want a youthful looking skin always. 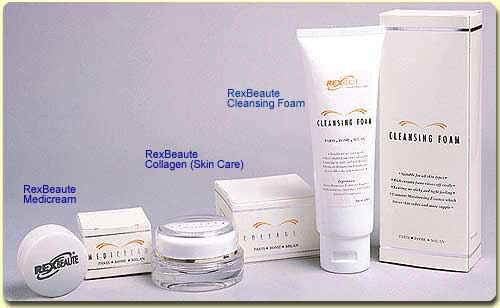 Rex Beaute is a new found cream. Its active, effective ingredients tested clinically by specialist from France and Italy. Pimples - Cures and easing away scars and helps prevent it from reappering. Dry Skin - Helps moisturizes the skin and activate dead tissues. Doing away with uneven skin tones. Oily Skin - Helps reduce skin pore from producing extra oil. Rough Skin - Helps smoothen, cleans, shines and makes the skin fairer. Pigmentation - Soothes away pigmentation marks on the skin, keeping the skin clear and supple. Apply thinly on the inflamed spot and all over the face twice daily.